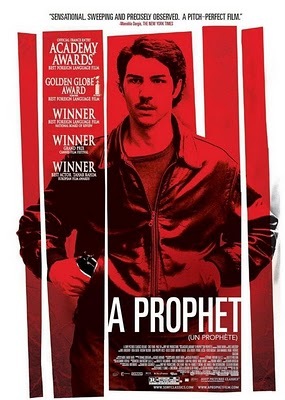 Imprisoned for six years for an unspecified crime, illiterate French-Arab teen Malik (Tahar Rahim) is initiated into the prison’s criminal underworld. A ‘quick study’, he soon plots his ascendancy through the extremely brutal hierarchy of his fellow inmates. Perceived as a greasy Corsican by the Arab inmates and a dirty Arab by the Corsican criminals, Malik is our guide through the violent and nightmarish labyrinth of the French penal system and its network of warring tribes. Lead actor Rahim gives a masterful performance, conveying different parts of his character – from keen student to wary tough guy – in the shift of his brow. Malik as our ‘hero’ is an empathetic character whose choices, or lack of choices, are understandable, even if they’re not relatable. This is an excellent, albeit disturbing, film – director Jacques Audiard has created a modern French crime film and a gritty prison drama that’s ambitious and thrilling. You’re welcome – I hope you enjoy the film. It did win, and was nominated for, many prestigious awards, such as: this year, it was nominated for an Oscar (Best Foreign Language Film), a Golden Globe, and at the Independent Spirit Awards (which I worked for many years ago), and won a BAFTA in this category; it won the Grand Jury Prize at Cannes 2009, and was also nominated for The Golden Palm; and, generally big in France, it won in a variety of categories at the illustrious Cesar Awards.